But the business of software building isn't really high-tech at all. It's most of all a business of talking to each other and writing things down. Those who were making major contributions to the field were more likely to be its best communicators than its best technicians. Software-intensive systems are technical systems whose behaviour is strongly influenced by large software systems. As the functional and operational requirements on such systems are increasing, the complexity to create them is becoming a critical factor. In consequence, those systems may only be built with the combined effort of many people requiring the division of labor. Controlling that complexity should be a natural interest of all participants in this creation process. 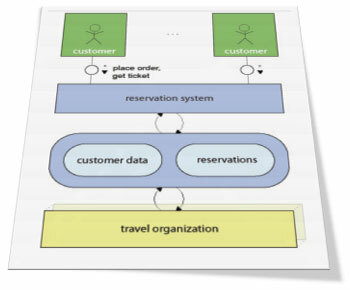 The Fundamental Modeling Concepts (FMC) primarily provide a framework for the comprehensive description of software-intensive systems. It is based on a precise terminology and supported by a graphical notation which can be easily understood. Modeling we call the intellectual activity of creating a model of some system with the goal to capture its essential structures necessary to understand its (existing or planned) behaviour (internal and to its environment) and to describe these structures in a comprehensive way.